Best WordPress Hosting 2019: Which One Should You Choose? Top 10 Best WordPress Hosting Providers of 2019: Which One is Right for You? 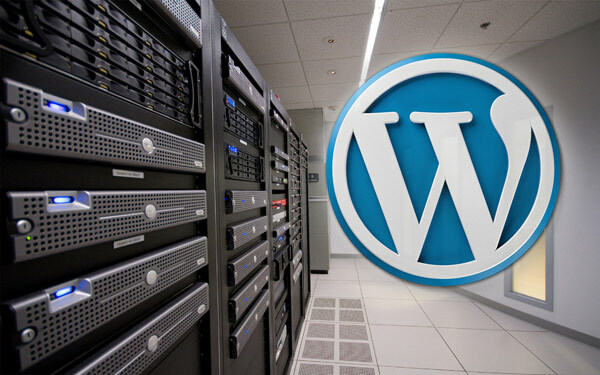 Finding the best WordPress hosting that provides reliable hosting with decent technical support and maximum server uptime is a little bit tricky job, especially for starters. So, to make this hurdle of choosing the right host easily, I have crafted this an in-depth and detailed post. There are various web hosting services available which offer expensive and inexpensive hosting with different features on the internet. But prices also depends on features and quality, so it’s hard to find all useful features in low-cost hosting. It is easy to find web hosting providers, but every company didn’t offer the bandwidth and storage as we expect or what they claim. However, with a little effort, you can find a perfect wordpress hosting which delivers excellent services and high-quality web hosting at good rates. If you’re a beginner who wants to create a WordPress powered website, then you should consider quality host and domain registrar. You should choose the best hosting for wordpress and domain name registrar for buying your site name. You can buy both (the domain and hosting) from one company or either from two different companies. In my recent article, I discussed some of the top domain registrars to buy your site name and also how to purchase a domain name in five easy steps here. The second one will help beginner bloggers who just jumped into the blogosphere. However, If you are planning to buy a new domain name, must read both articles. If you have a small budget or not able to buy top level hosting like managed hosting, then you can choose shared WordPress hosting starter plan which is also the best solution for WP based websites. Note: If you are a beginner or your site doesn’t have much traffic, don’t buy Pro or Business hosting plans for your website. These hosting plans are too much expensive and only suitable for heavy traffic sites or suitable for those, who want to host multiple sites. It is one of the crucial factors while choosing any web hosting, you should double check prices. You can save significant money by picking the right and best wordpress host for your site. There are lots of web hosting companies available out there who offer hosting plans at different rates. Always select who meets your need and never go for the big package, if you don’t need. Otherwise, you’ve to pay more money. Now, you have found the affordable host but is it provides the maximum 99.9% or even 100% server uptime? Because if your hosting server goes down too often then how visitors can reach out to your site? Simple, they can’t. So, you must verify that they must offer maximum uptime, almost every good WordPress hosting company claims to deliver 99.99% uptime. Well, this factor also very critical and your hosting should provide 24/7 technical support via Live Chat, Email, Phone Call or at least Ticket support. But, I would recommend Live and Phone support because of these ways you can easily contact them whenever you face any issue. Assume that; you have an issue, but the company doesn’t support live chat and phone support. What will you do? Send them a ticket and wait hours to get their reply? In the meantime, you’ll lose lots of visitors. Always choose the wordpress host who provides bulletproof security measures and implements latest security patches to protect your data from any vulnerabilities. It can significantly decrease chances of hacking, brute force attack, and block fake bots which hackers usually use to access websites. Last but not least, before going with any hosting service, to secure your investment, must verify that they claim money back guarantee for at least 30 days. Why? It’s simple, I know you’re genius enough to figure out why I said that? If they don’t deliver what they claim, or you find their service is crap and worth using, you could ask for the refund and get your money back. Usually, trusted and reliable WordPress hosting provider offer 30 days refund guarantee. WordPress platform requires the following configuration for the hosting server where you want to install it. So, before buying any wp hosting, you should check whether it meets the following specifications or not. WordPress.org recommend Apache or Nginx. You must take care of these points. Keep in mind, below mentioned WordPress hosts fulfill the requirement to run WordPress smoothly. InMotionHosting is CNET top rated hosting for WordPress platform due to their best business practices, secure site transactions, outstanding performance, and 100% customers satisfaction. BBB (Better Business Bureau) rated them A+ ranting. It’s another best web hosting for WordPress to start your site right away. They have category A, PCI compliant data centers that give you 99.99% uptime with SSD’s storage drives to make your site incredibly faster. You can easily install markets most popular open-source platforms such as WP, Joomla, Drupal, Gallery, and Prestashop. Their 24/7/365 days live chat, phone, and email technical support makes them more reliable and trustable. You can make your website always in motion and accessible by picking IMH hosting services. With a lot of features and services hosting packages are very affordable, starts from $4.99 per month with upto 56% discount (through this exclusive link) include a free domain name. GreenGeek powered by renewable energy and featured by PCWorld. It is a California based hosting company, founded back in 2008. Currently, they are powering 300,000+ websites to make them online 24/7 with 99.9% uptime. You can install industry top level CMS such as WordPress, Joomla, Drupal with one-click installation option. Also, you can create unlimited sub-domains, unlimited email accounts, unlimited parked domain, and MySQL databases makes more sense to go with this web host. With decent hosting plans at the low prices helped them to catch those 3,00,000 happy customers. It provides unlimited Space, Transfer, E-mail accounts and free domain name till you pay the hosting bill. Their hosting plans start from $3.95/month with 30 days money back guarantee. Are you planning to change your host and worried about how to migrate the site, don’t worry. They will migrate your site without any extra charges. SiteGround is known as the fastest WordPress hosting service. You can host a single website on “Startup” plan with 10 GB storage space. The best thing about Siteground is you don’t need any CDN services because their hosting comes with built-in Optimized CDN. Their optimized hosting will never let your site down for a second. MyTipsHub also hosted on their servers right now. They have made an in-house cache mechanism called SuperCacher which makes your website enough faster to satisfy your visitors or customers, and this thing encourages users to give them 9.5/10 rating. SiteGround claims 99.99% uptime with 24/7 technical support. Hosting plans start from; Startup plan $3.95/mo to GoGeek $14.95/mo. The one biggest disadvantage and limitation of using SiteGround is, they offer visitors based bandwidth limit. Startup hosting plan suitable for 10K monthly visitors and GoGeek supports only 100K visitors/month. A2Hosting is another best WordPress hosting provider which was started in 2003 and server different type of hosting such as shared, dedicated, reseller, and VPS hosting at affordable prices. You can choose their turbo servers to get 20x fast website loading speed. They are in this business for more than 12+ years and has an expert development team to help you fix site issues. In 2013 and 2014, they launched SSD hosting to deliver the fastest storage solution and A2Optimized WordPress hosting. A2Optimizer comes with even shared hosting and can be enabled with just one click activator. They have been upvoted by many web hosting reviews sites such as HostingFacts, Bitcatcha, HostAdvice, and CastiroHosting as one of the best WordPress hosts. A2Hosting’s Lite plan allows you to host one website, unlimited data storage, unlimited bandwidth, 5 databases, and anytime refund at the price of just $3.92 per month. Keep in mind, each hosting plan includes SSD drive storage to provide exceptional load speed. 24/7 technical support, Live chat, 99.9% uptime, and free site transfer makes more sense to give them a try. These bunch of high quality features comes with very reasonable prices and make them one of the cheap WordPress hosts. BlueHost is one of the most famous and great WordPress hosting companies out there to start a blog without spending a single extra penny. The journey of this company was started in 1996. It owned by Endurance International Group and one of the largest web hosting industries. They have more than 2 million domains hosted on their servers. Their hosting plan starts at $3.49/month. BlueHost offers free domain as a bonus when you buy hosting from any hosting plans. They provide unlimited space, unlimited bandwidth, 24 hours online chat, phone or E-mail support, free built-in CloudFlare at very affordable prices for higher plans. It allows you to create and manage over 100 e-mail accounts with 5 parked domain facility. It includes all the main features such as PHP, MySql, E-mail, and sub-domains capability to satisfy clients. And also, they provide dedicated IP address + spam expert for Prime and BlueHost Plus hosting plan. Here is an in-depth Bluehost review to know more about it. Followings are the features and benefits you’ll get from BH. Over 30,000 customers from upto 120 countries have already chosen their services due to incredible customer service, servers speed, and robust security measures. Their proactive dedicated lab’s team and full-time engineering staff always research to innovate bleeding edge wordpress technology and advanced features to provide better user experience to their customers. They actually got success in this and WPEngine users love them. Here are features you will get if you want to buy their hosting plans. Your dream of creating a website may come true by choosing DreamHost. DreamHost currently empowering over 1.5 million domains on their platform for the last 18 years. 100% uptime, 24/7 instant support, and stability make it the great company for creating your wp powered website. At least once give them a chance to serve you, I am sure you will never leave them due to their incredible services. They achieve excellent reputation and popularity in the world of web hosting companies due to their best hosting and technical support. They offer high speed SSD hosting that load your website 200% faster than others. You can get one free domain forever with hosting plans, and here DreamHost beats many other hosting companies. Because others offer the domain name for the first year, but DreamHost offer it free for lifetime till you pay hosting bills. 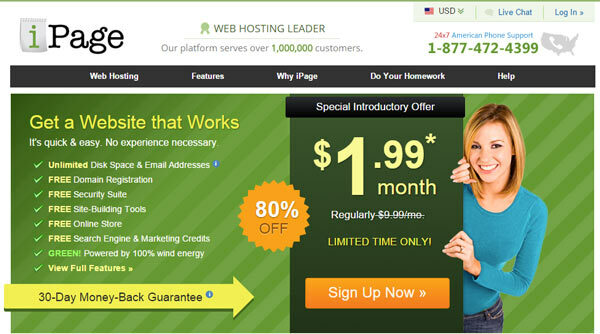 Their hosting plans start from $7.95/month with the option of 97-day money back guarantee. If you want to know more about DreamHost, then read this detailed DreamHost Review. 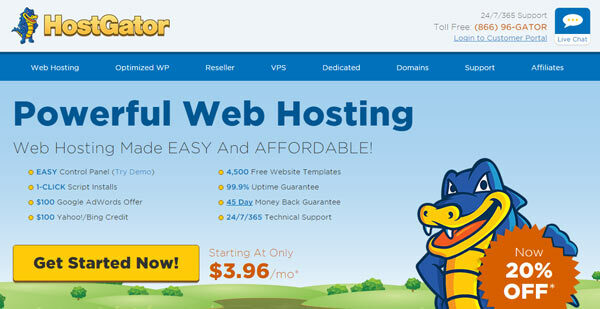 Hostgator is another award-winning shared cheap “best” WordPress hosting and that’s why many WP users love it. It was founded in 2002 by Brent Oxley. Hostgator offers affordable WP web hosting plans with professional technical support at lowest prices. They provide all types of hosting like Shared, VPS, Dedicated and Reseller at cheap costs. Hostgator currently hosted over 8 million domains on their servers. It is a well-reputed company in hosting business. Their Cpanel UI is user friendly, and you can manage it efficiently. HG offers an easiest and simple way to start your website with one click install option. Newbie site owners or bloggers can easily control and manage their website. HG offer 99.9% uptime and 45 Days money back Guarantee. iPage got 9th place on our list due to cheap plans, this one is much cheaper than any other. It is empowering over 1 million customers till to date under their hosting platform. And they claim 99% uptime with 24/7 technical support. You can get one free domain name for lifetime by purchasing the hosting plan. They offer free domain name till you buy the hosting plan from them. It is one cheapest hosting in shared WordPress web hosting with maximum advantages. iPage has outstanding customers rating and reviews. I recommended using iPage because of their cheap prices, within $24 you can get one domain and hosting package to make your website live for the whole year. iPage offering 80% off for the limited time so buy now your site and hosting at inexpensive rates. Also along with these remarkable packages, they offer 1 GB Cloud storage absolutely free. MyTipsHub visitors can get upto 75% discount here, So grab the deals and save big money. For more details check out latest iPage review. Web Hosting Hub has been great to deal with when it comes to domain registration and web hosting. The journey of Web Hosting Hub start in 2001 and grabbed customers attention by providing impressive packages and 24/7 live support. It provides outstanding technical support whenever you need, and BBB(Better Business Bureau) accredited. 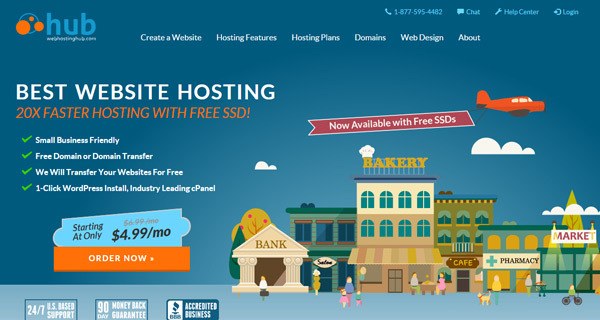 Like many other great wordpress web hosting providers, WebHositngHub also offers one free domain with SSD’s powered webhosting package starts at $4.99/month. You can run 2 websites on a single hosting plan with the ability to create 25 subdomains and 5 parked domains. Also, they offer one-click CMS installation include a free site builder facility. They provide Shared, VPS, Dedicated, and cloud hosting. Note: Personally I tried to know how good they are in support. I clicked on live chat option and leave my query, believe me; they respond within 1 minute I was amazed because they are even faster than many other WordPress hosting providers. In case, you already have a website which is getting massive traffic then WPEngine is the right solution for you. It is incredibly faster, highly protected and offers expert technical live support. However, it’s a great choice when it comes to managing massive traffic or big websites. Have you used any hosting company mentioned above on the list before? Do let me know your (good/bad) experience with your current web host and which one you’re using right now? If you are an old user please let me know which one is your best WordPress hosting? Please share your thoughts and experiences in the comments section below.